A Harris County deputy constable was pumping gas last week when a teen came up behind her. The story of what happened next has taken social media by storm. HOUSTON (KTRK) -- Deputy Tommi Kelley was having a bad day. It was raining. She was pumping gas, and a young man approached from behind. "He said, 'Ma'am can I stand here while I pump your gas?'" Deputy Kelley told Eyewitness News. " You see people standing around the street corners. It was kinda creepy at first." But then the young man, McKinley Zoellner, explained he wanted to have her back while she filled up her patrol car. "I wanted to do something nice for someone and show them that someone cares," said Zoellner, a 16 year old junior at North Shore High School. He stood there until she finished, wished her well, and then left. "He didn't want anything in return," said Deputy Kelley, a 13 year law enforcement veteran. " He just said have a good day and turned around and walked off and got in the car." Deputy Kelley went to his car, thanked him and his mother, snapped a photograph and posted it to Facebook. More than 216-thousand people have shared her post. "I think my son is amazing," Jennifer Zoellner beamed. She's McKinley's mother. "This is something he wants to do. He wants to help people. " Zoellner's act of kindness is one of so many in the days since Deputy Darren Goforth was shot and killed at a gas station. Killed for nothing else prosecutors say other than wearing a uniform. A community rallying to show support for law enforcement. "I would tell anybody who wants, anybody who gets the chance to do it," said Zoellner of his good deed. "It's a good thing for someone. You're showing people you do care. " "He got a big hug and he said he'd never had a hug from a police officer," said Deputy Kelley. "It meant a lot to me, especially with everything that's been going on lately. " Zoellner says he wants to keep serving. After graduating f in 2017, he wants to join the US Air Force. 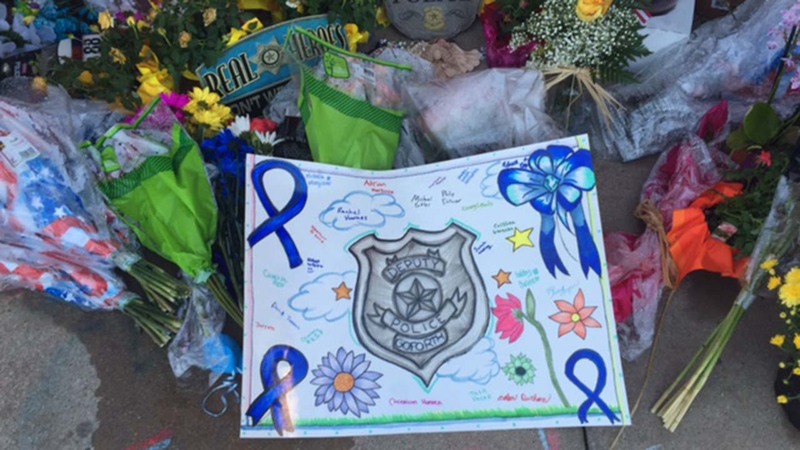 Photos of Deputy Darren Goforth's funeral.